dynamics and the geomorphology of this Environment. 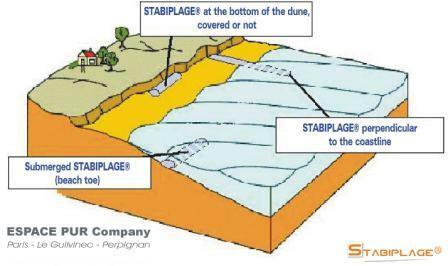 STABIPLAGE® respects these exchanges because it does not block sediment drift. These works use a minimal space while offering an optimal solution. The installation of STABIPLAGE® does not need heavy means of technique. avoids the inopportune frequentation of haulage machines. In the contrary case, the quantity of material remains tiny : 150 m3 for 70 m of work. These concept obviously has positives consequences on the safeguarding of the site but also on the price of the operation. ecological tricks on all the immersed works. results as the works cover themselves in the harnessed sand or river vegetable species. sands, sediments, etc.) attenuate gradually, and without danger, its clear colour. work is enough to control the erosion of the site. Moreover, they use a reduced space: they avoid any vision of massive construction. The aesthetic and the attraction of the beach are thus preserved. Before their natural covering, they appear as half-cylinder on which one is able to walk without difficulty and or any danger. Due to their shell, one can go barefoot on it. marked out and is located in the non navigable zone. than the time required by the heavy works. This time saving may be very significant when the sea threatens the infrastructure and the residential areas. A direct impact on the local or regional economy or on the safety of the resident, involves a reduced reaction time and an effective method of protection. Effective means that the expected results are obtained. durability, major factor for the complete success of a project. This longevity is beneficial for the Communities that uses this type of work: abolition of the cost maintenance.